So… I think I’m going to have to give up beauty blogging. I never want to try another skincare product again because I think I’ve found the holy grail. Nothing will compare to this. 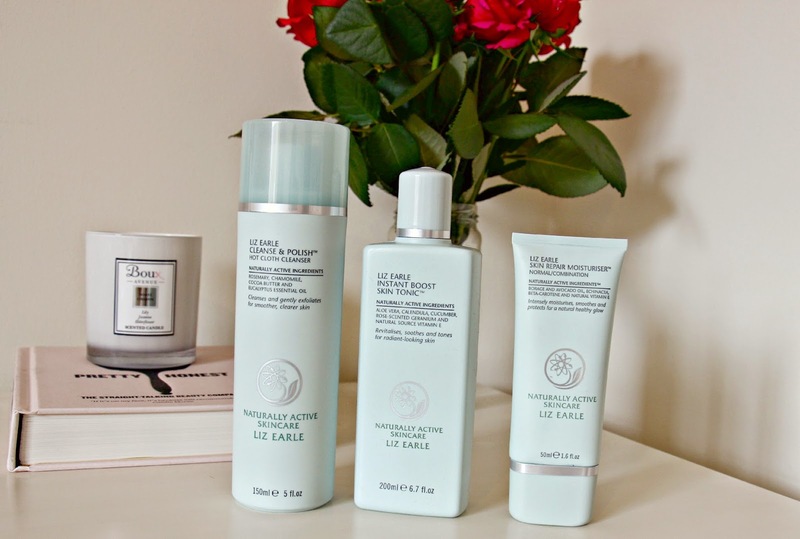 For those of you who have not yet tried Liz Earle skincare, you may think I am massively over-reacting *rolls eyes* but many of you will have tried these products, and you’ll just be thinking ‘duh! About time you figured it out!!‘. So yep, I’m late to the party. Lots of my friends swear by Liz Earle Cleanse & Polish, some girls point blank refuse to use anything else, even carrying their big tubes in their overnight bags instead of just using some of the (many, many) skincare products which I have in my bathroom cabinet. It’s like a cult, they were addicted. And now I can see why. When I get a really good feeling about a brand, i’ll go all out and use the entire range, committing to the cleanser, toner, exfoliator, moisturiser and masks for my skincare routine – this, I feel, gives me a good idea if the brand really is fabulous or if it’s just a combination of all the products I’m using. I’ve been using Liz Earle as my only skincare products for just over a week now. Usually I’ll wait three weeks before reviewing skincare as I feel that that’s the length of time it takes before I can get a really good idea about something, but I already know that I can 100% happily recommend the brand. The cleanser is a thick cream, I dispense two pumps into my hand and massage over my face using fingertips, I massage down the neck, then finally work it into my eye makeup, and it dissolves even the most stubborn mascara. Then, I soak the muslin cloth (two are provided) in warm water, and hold it over my face for a few seconds. Mainly because it feels really nice and realising, but also the warmth and moisture loosens up makeup and dirt, then I massage the cloth in circular actions to remove my makeup. I’m a little more careful on the eye area, pressing the cloth down and blotting at my mascara and liner, before doing ever-so-gentle sweeps until my eyes are clean. It’s thorough, yet gentle, no tight feeling afterwards. I am usually pretty thorough with my cleansing routine, yet I still notice a dramatic difference already since getting into the Liz Earle skincare routine – my skin looks great even with no makeup on, makeup stays looking great for longer, and it feels nourished and clean. Also in my Liz Earle routine is their Instant Boost Skin Tonic, which I apply to a cotton pad to tone after cleansing; it has a subtle scent and doesn’t feel drying or tightening like many other toners I’ve tried recently. If there’s even the slightest amount of eye makeup left, i’ll also soak a cotton pad in the Soothing Eye Lotion, which, as the name would suggest, soothes tired eyes as well as removing traces of eye makeup. I’ll finish with the Skin Repair Moisturiser which sinks straight into my skin and gives a natural glow. For once, I’m more than happy to go without makeup on my ‘at home’ days – where as usually I’d want to apply a tinted moisturiser to give my skin an even finish, but I have been loving how my skin looks and feels since starting the Liz Earle routine. Cleanse and Polish is available for £15.50 for 100ml, and this includes two muslin clothes. There are also some limited edition cleansers which you can try out in this adorable set (I want one!!) for £50.00 here. If you want to try it out first, you can also purchase a 30ml tube of C&P and a muslin cloth for £6.00. Have you tried Liz Earle skincare yet?